If you love Newman’s Own dressings, here’s your chance to win a Newman’s Own goodies, like salad dressings, pasta sauces, and much more. Newman’s Own, the food brand with more than 200 foods and beverages that donates all profits to charity, recently celebrated the launch of “Greens for Good,” salad recipe contest. The contest is designed to reflect the philosophy of Paul Newman, the brand’s founder of making great tasting food for the benefit of charity. Fans submit their favorite salad recipe/dressing pairing for an opportunity to direct a $35,000 donation to their charity of choice. The contest judge is “Top Chef” Judge Hugh Acheson—a vegetable connoisseur and seasonal cooking aficionado— who also helped launch this program by creating an exclusive salad recipe featuring Newman’s Own Salad Dressing. Five Appetite for Health fans will win the prize from Newman’s Own. To Enter the “Greens for Good” contest, click here. To Enter to win the Newman’s Own prize pack, leave a comment below. another great give away, how do you two do it? I LOVE Newman’s Own Gluten free products!! I think thats great they are giving a contest with the prize going to a charity of their choice. What a huge prize and it goes to good. Thanks for the giveaway here too! Good luck everyone. Awesome i have never tried Newman’s Own products but have heard a lot of great things about them. This would be awesome, I have yet to try Newman’s products! Great charity work they do. Creating an exclusive salad recipe featuring Newman’s Own Salad Dressing sounds fun. The first Newman’s Own product I ever tried was the popcorn. Great quality and great mission! YUM!! I love Newman’s Own salad dressings!! So much flavor!!! I’ve never tried his spaghetti sauce, but I’d love to!! Thank you for the chance to win some great products! Awesome products fromNewman”s and would love to try them! I would love to try Newman’s products. I hear they are very good. We love Newman’s Own products! They always seem fresh & yummy…and when I read the labels, they look healthier than many of our other options! I love Newman’s own Sockaroni sauce! I’ve never tried the brand’s other products, but they sound tasty! Would to give all their products a try. These Newman’s Own are healthy and great. Thanks. We love their pasta sauce. I’d love to try their dressing. Would love to try some new products from Newman’s Own. Thank you for this opportunity. Looks like a great prize pack. Thanks for the chance to win. I eat a salad every day and enjoy Newman’s Own Balsamic Vinaigrette. I’d love to try some of their other products. I love how the company gives to charity, too. I absolutely love Newman’s Own Lite Italian Dressing which is the only dressing that I use when I make my fabulous homemade pasta salad. I would love to try all the other products they offer as well. Thank you for this opportunity! we love newman’s own dressings. I’d love to try some other products. Honestly I don’t think I’ve ever had anything of theirs I haven’t loved! Thanks for the chance! Love to win this prize. good stuff. I love Newman’s Own Lite Caesar dressing. Unfortunately the store that carried it near me has closed. I haven’t tried any Newman’s Own products yet. They have a lot to offer! Thanks! I love the dressing and salsa! I would love to win this great gift package! Newman’s Own is one of my favorite brands due to quality & the generosity of them to donate all profits to charity. This is a wonderful prize! Thanks for the chance. I would love to try these! I have heard about them. I didn’t even know that they made licorice. I have “Shared” on Facebook. I’m using the Balsamic Vinaigrette right now, love the Sockarooni spicy pasta sauce, and even my cat loves the pet food line! Good karma abounds, because the profits go to charity. Would love to win the prize pack. Love Newman’s products and would be thrilled to win some!!! I want to try these out! I have never had any of them! I would love to give these products a try and appreciate the company’s generosity in giving to charities. I would love to try these products! I’ve not been disappointed in the past with Newman’s prducts. YUM! I would love to win this! I haven’t tried any Newman’s products, other than the cat food for my cats. I have used many Newman’s Own products and I especially love the chocolate. Sweet!!! I love Newman’s Own products and would love to try something new! thanks! 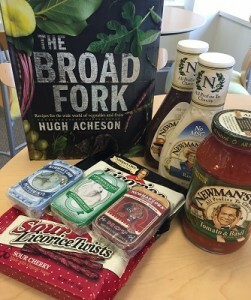 Asesome giveaway, I love his pasta sauces and cookies, would love to try these products, and the book sounds great! I have some Newmans Own cookies in my pantry right now. They are very good and organic also. I’m on an organic test diet to see if it will help my pancreas. I’m a diabetic. I love Newman’s Own products, especially goodies I can feel good about eating! I have always admired the generosity of the Newmans and the charity they created. I really like the products I have tried. Thank you for the opportunity to win a goodie box. I would like to win and try the salad dressings. I’d love a chance to win the prize pack and taste that licorice! Great that they still donate all their profits to charity. Thanks for the chance to win such a great and healthy prize. I have tried a Newman’s dressing once. And found it to be yummy. Didn’t know there were other products. Would love to try these and make them apart of my eating routine. Thanks for the opportunity to maybe get to try the other products. I’ve never tried Paul Newman’s products although I’ve wanted to. I’d love to win! Newman’s makes the best pineapple salsa! YUM! I love Newman’s salad dressings and sauces which no other compare. I was unaware of the other products he has out and would love to try. My favorite salad is mixed baby greens, beets, corn, turkey or chicken, egg and bacon chick peas and Newmans balsamic vinegar oil dressing. I love that Newmans products continues to put the proceeds towards the most needed charities. Way to go Newmans! Newman’s Own dressings are my favorite dressings and I love all their products. Has anyone tried the licorice? Awesome!! Would love this. Thanks.